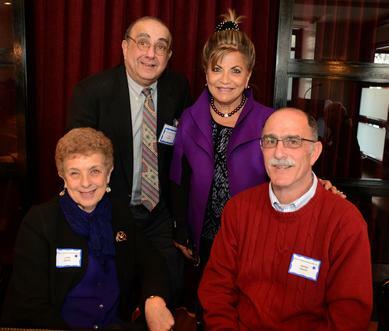 Photo: Among those present at the Woman’s National Democratic Club (WNDC) luncheon, Thursday, February 26, 2015, in which Author Joe David discussed the historical events contributing to his book, The Infidels, was International Armenian Philanthropist Annie S. Totah, and Joe David’s two cousins, James and Judith David. James and Judith David are grandchildren of Reverend Jacob and Judith David who both courageously assisted the Christians during the Armenian-Assyrian massacre in 1915-18. Standing: Joe David and Annie Totah; seated: Judith and James David. WASHINGTON, DC – During a rousing talk at the DuPont Circle Hotel, sponsored by the Woman’s National Democratic Club (WNDC), Joe David, author of The Infidels, took a sell-out crowd of WNDC members and their guests on a journey to the beginning of Christianity over two thousand years ago.